This mosque is so fair and beautiful. I wanted it to look powerful but also mesmerizing. This photograph was taken last year in January, I hope to be there again soon . If you are there and you believe in God, you'll feel the atmosphere. The Sultan Ahmed Mosque is a historical mosque in Istanbul, the largest city in Turkey and the capital of the Ottoman Empire (from 1453 to 1923). The mosque is one of several mosques known as the Blue Mosque for the blue tiles adorning the walls of its interior. It was built between 1609 and 1616, during the rule of Ahmed I. Like many other mosques, it also comprises a tomb of the founder, a madrasah and a hospice. 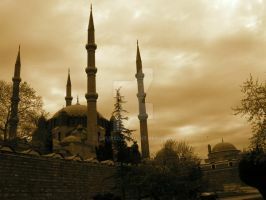 The Sultan Ahmed Mosque has become one of the greatest tourist attractions of Istanbul.